This weekend, I will be part of a village on wheels: one of 5200 cyclists riding in the Pan-Mass Challenge. This will be my seventh year riding in the two-day 200-mile bicycle fundraiser for the Jimmy Fund at the Dana Farber Cancer Institute. With your help, I have raised nearly $45,000 for the cause over the years. 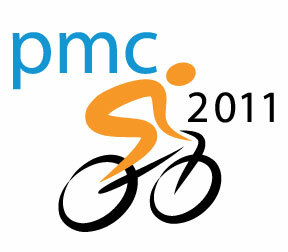 As a group, PMC riders and sponsors have raised more than $165 million over the past six years. If you haven't yet contributed this year, it's not too late; please go to my PMC profile page and donate to the cause now, or through September. This year's fundraising goal is $31 million, to mark the 31st edition of the ride. For a taste of past years' PMC weekends, see here, here and here. I invite you to follow the PMC: All PMC tweets will be shown right here on HealthBlawg (Friday afternoon through Sunday evening) and there will be plenty of coverage throughout the weekend on NECN as well. If you'd like to follow my tweets only, head over to HealthBlawg on Twitter. I'll post more on the ride after the weekend is over.